Black and White and Loved All Over: Baby Black Eye. Last night Tessa ran, tripped and fell at full force into the metal frame of our bed. I was in the bathroom, just out of the shower, rubbing lotion on my face, when I heard the sound of it. It was the worst sound I have ever heard. I mean it. I can't even explain it. I ran in and had her in my arms before she, all kinds of shocked, even started to cry. Her fresh cut turned pale blue and then began to ooze blood, as her eye inflated and turned an ombre of angry colors. While she howled, I tried to remind myself to breathe, but it was a task. I was home alone with her and scared to death, thinking of all the things that might be wrong or that could go wrong. By the time she'd stopped crying I was crying hysterically, inconsolably. Finally once I calmed down enough I put her in the car and drove to the ER, where we met Nekos and my mom. In the end, they told us she had an orbital contusion (fancy way of saying "black eye") and a possible orbital fracture, though they didn't want to risk putting her under and exposing her to radiation with a CT scan to see about the fracture. The nurse also told us that her eye would likely be swollen shut this morning, and it was, mostly. 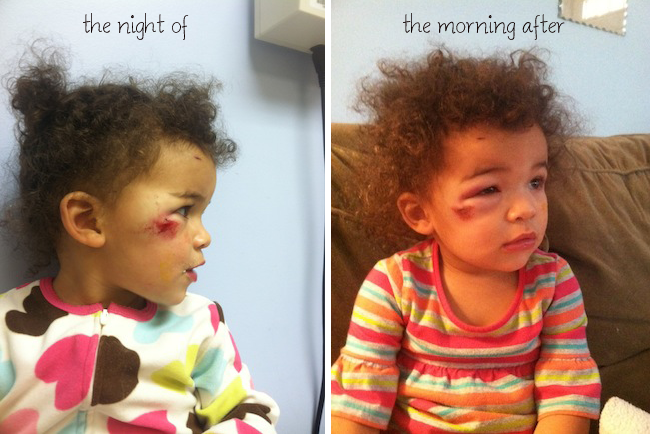 The picture on the right is from a few hours after she'd woken up, so her eye had actually deflated a bit. She looks terrible, like a baby boxer after a brutal match, but she seems to feel just fine, and I am so relieved that she didn't hit anywhere near her brain, or directly on her eye, nose or mouth. I am so relieved that she's going to be OK. We are so lucky. My takeaway from this freak accident is to try to limit her running in the house, which I normally actually encourage because I like her to "get her energy out" and get exercise and be the wild little spirit that she is. She was actually wearing shoes and socks when it happened so I'm not sure how she tripped or slipped. It's just hard to know where to take her to get all of this energy out when it's cold outside, but I think more trips to the science center are in order. In the meantime, she gets lots of love from mom and dad and any food, cartoon, book, or toy she wants in the world! Oh my goodness! I can only imagine the fear you had when you were rushing her to the E.R. I'm so glad she'll be okay. Sometimes things like this are worse for the mamas and daddies than for the kiddos. Happy healing to your prize fighter. Ouch! Poor little girlie! It looks like it hurts. It's only a matter of time before our kids hurt themselves I guess, and I think sometimes we freak out more than they do. Oh my gosh! That hurts my heart just to see it! I'm glad she's going to be okay. Man, she skipped the goose egg and just went straight to the swollen black eye! Sheesh! aww!! poor baby! and mommy! ooooh! that is rough! phew, glad everyone ended up okay. This hurt my heart. It's so hard seeing your child in pain. Hope Tessa feels better soon! There is always the little play gyms at the mall if your mall has them! oh poor Tessa! i hope it goes away soon and i'm glad it wasn't worst. hugs. Oh my! I feel so sorry for BOTH of you. I remember my son bumping his head and it turned the deepest shade of purple ever. I still remember him cowering and holding it and having the WORST cry I have ever heard. Or maybe that was me? So, I feel your pain. Praying that it heals quickly!!! poor tessa! that had to have HURT. i hope all that swelling goes down soon. you could try arnica. it is homeopathic and it makes bruising disappear much faster than without it. aaah poor baby! i hope she will be fine soon.